ATMOS POWER PVT LTD is ISO certified 9001:2008 company. We have leading satisfied customers in GUJARAT. ATMOS POWER PVT LTD is leading Manufacturer, Designer & Supplier Company. We are following the ISO coding system in our manufacturing and designing.We have capable technical service engineers & technical team who provide satisfactory services to client’s requirements. The process of producing oxygen from oxygen plant involves taking air from an air compressor, separating oxygen from nitrogen and other gases by means of special Zeolite Molecular Sieves. The system gives a continuous supply of oxygen by automatic switching towers on a timed cycle. It can be adjusted for a oxygen purity up to 94%, although the most economical for practical purposes is 85%. In the process of regeneration, the adsorbed nitrogen is subsequently discharged as waste. The resulting product gas is around 85 to 94% pure oxygen available at around 2.5 kg/cm²g pressure. The gas is very dry containing little or no moisture. 5) Oxygen is also called the medical gas, but the one used for medical purposes is the purest form of oxygen. This form of oxygen is treated and purified to make it suitable for medical use. ATMOS POWER PVT LTD is ISO certified 9001 : 2008 company. We offering PSA (Pressure Swing Adsorption) and VPSA (Vacuum Pressure Swing Adsorption) technology based OXYGEN GAS GENERATION PLANT. All systems are designed for un-attended operation and automatic Oxygen demand adjustment. The design and Instrumentation makes the plant size very compact, assembly on skids, prefabricated and supplied from factory. Start-up time is only 5 minutes to get desired Oxygen purity. So these units can be switched ON & OFF as per Oxygen demand changes. 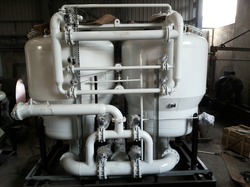 Very reliable for continuous and steady operation with constant Oxygen purity. Plant availability time is better than 99% always. Expected Molecular sieves life is around 15-years i.e. whole life time of Oxygen plant. So no replacement costs. Atmospower is a ISO certified 9001:2008 company. We follow the ISO coding system in our manufacturing and designing and capable technical service engineers that provide the most superior services to meet our client’s requirements. The process of producing oxygen from Oxygen Gas Plant involves taking air from an air compressor, separating oxygen from nitrogen and other gases by means of special Zeolite Molecular Sieves. The Oxygen Gas Plant gives a continuous supply of oxygen by automatic switching towers on a timed cycle. It can be adjusted for a oxygen purity up to 94%, although the most economical for practical purposes is 85%. In the process of regeneration, the adsorbed nitrogen is subsequently discharged as waste. The resulting product gas is around 85 to 94% pure oxygen available at around 2.5 kg/cm²g pressure. The gas is very dry containing little or no moisture.